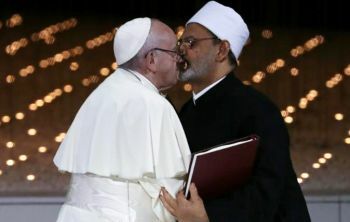 The pope and the grand imam of al-Azhar signed a historic declaration of fraternity, calling for peace between countries, religions and races, before an audience of religious leaders across the world from Christianity, Islam, Judaism, and other different beliefs. Pope Francis, the leader of the Catholic Church, and Sheikh Ahmed al-Tayeb, the head of Sunni Islam’s most renowned seat of learning, arrived at the ceremony in Abu Dhabi hand-in-hand in a symbol of interfaith fraternity, reports The Guardian. The pope specifically called for an end to wars in the Middle East, naming Yemen, Syria, Iraq and Libya. All religious leaders had a “duty to reject every nuance of approval from the word war,” he said in a 26-minute address.